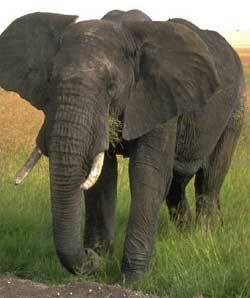 · Female gestation (length of pregnancy) in elephants is 22 months - almost 2 years! Elephants are very intelligent animals, with a sophisticated system of communicating. Like whales, they can create sounds that are outside the range of human hearing (called subsonic* sound). By blowing air through large chambers in their nasal passages they can create low rumbling sounds that can carry as far as five miles (8kms). No matter how loudly you screamed, even through a megaphone or a public address microphone, you couldn't be heard by another person five miles away! Being able to communicate with other groups of elephants helps the elephants to detect danger and warn others, as well as to find water, which is extremely scarce in some parts of Africa. African elephants are intelligent enough to be able to detect water flowing underground and have been seen digging up water in a riverbed that has run dry. Elephants really are amazing animals!!! !